The euro will weaken further over the coming year, according to analysts polled by Reuters, who said the possibility of further stimulus from the European Central Bank due to rising deflation risks will drag the currency lower. The strength of the euro was described as a "serious concern" by ECB President Mario Draghi in May when he first hinted at a broad-based asset purchase programme. The currency has slumped almost 10 percent since then, trading around $1.262 on Wednesday. But the poll taken this week showed currency strategists were split on whether the ECB is comfortable with the current exchange rate. Sixteen of 30 strategists said the ECB is comfortable with the current euro/dollar rate. The remaining 14 strategists said it needs to fall further and gave a median of $1.20. The euro was trading near $1.40 in June when strategists said the exchange rate would need to drop to $1.30 or lower for the ECB to be comfortable with it to help raise inflation. Despite the currency falling well below that level in recent months, inflation, now just 0.3 percent, has remained stubbornly stuck at multi-year lows. That has left strategists wondering if the currency has to fall further. "Clearly the ECB would now be happier with the level than it was two months ago -- that would be a relief. But there is concern that the disinflation evident in the euro zone might not be temporary," said Jane Foley, FX strategist at Rabobank. "As long as there is this risk, the ECB would be happier with a lower exchange rate." The poll of 60 currency strategists predicted the euro will weaken to $1.26 by end-October and then further lower to $1.22 in a year. All the common contributors in the latest poll compared to the previous month have slashed their forecasts - a few notable downgrades came from Citi, expecting the euro to touch $1.16 compared with $1.32 forecast earlier and Barclays, cutting its forecast to $1.10 from $1.25. 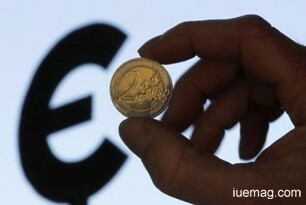 "We expect the euro to be among the biggest losers. It feels like a lower euro is the only intermediate objective the ECB has to stabilize falling inflation expectations," wrote Jeremy Hale, macro strategist at Citi in a note. The ECB is due to give details of the central bank's securitised assets purchase programme after its rate-setting meeting on Thursday. But with rising risks of deflation, anemic growth in its largest economies and poor demand from banks for the first tranche of new cheap loans in September, the ECB may be pressed to do more. Among the last options is a full-blown quantitative easing programme (QE), involving buying sovereign bonds, like in Britain and the United States - both of which first started printing money over half a decade ago. "I think Draghi will continue to hang on to the threat of QE. There are a lot of theories that suggest that even QE will not be successful but I think the ECB may finally be pushed into doing it anyway," Foley said. The poll also showed the entrenched rally in the greenback will likely continue over the next year as the Federal Reserve gets ready to raise rates amidst a raft of strong economic data, despite the dollar index already trading near a four-year high. It has gained for 11 consecutive weeks now. "The outlook for the Fed and strength of the economy remains in stark contrast to the outlook for other major economies, such as the euro zone and Japan. That divergence theme was a key driver for the U.S. dollar in September," wrote Peter Dragicevich, currency strategist at CBA.